The Tel Aviv Museum was started in the home of Tel Aviv's first mayor, Meir Dizengoff in 1932. It was later moved to a nice airy Bauhaus style building right next to the Opera and to two of Tel Aviv’s main theaters in 1971. Tel Aviv is sometimes called ‘the white city’ because of all the light colored Bauhaus structures, and the museum fits right in. In 2011 they added a shiny new wing. The two wings are connected with a glass hallway. The new wing looks like a space ship from the outside, and was the result of an international design competition won by the Chair of Architecture at Harvard. It manages to make the most of the triangular site, and makes great use of lots of natural light, even though a large portion is underground. There is a spectacular 87 foot high atrium know as the ‘lightfall’. The project was funded by Herta and Paul Amir. Paul is from Slovakia, survived the Holocaust, and came to Israel in 1946. He lived on a kibbutz until 1960, and then left for the US where he made his fortune in real estate development and amassed a great art collection. The restaurant is beautiful and has a great bar, and one bonus of the two wing setup is that there are two gift shops, one in each wing. 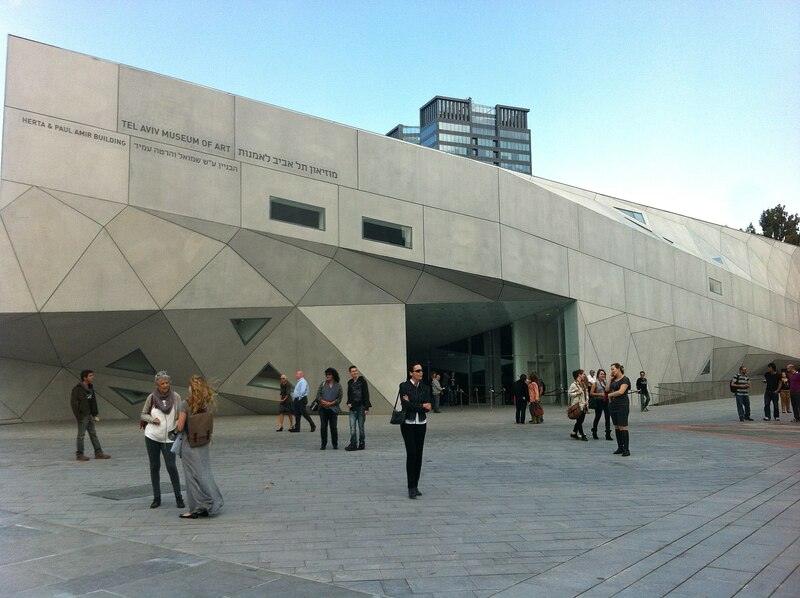 The Tel Aviv Museum of Art (Hebrew: מוזיאון תל אביב לאמנות‎ Muzeon Tel Aviv Leomanut) is an art museum in Tel Aviv, Israel. It was established in 1932 in a building that was the home of Tel Aviv's first mayor, Meir Dizengoff. The Helena Rubinstein Pavilion for Contemporary Art opened in 1959. The museum moved to its current location on King Saul Avenue in 1971. Another wing was added in 1999 and the Lola Beer Ebner Sculpture Garden was established. The museum also contains "The Joseph and Rebecca Meyerhoff Art Education Center", opened since 1988. The museum houses a comprehensive collection of classical and contemporary art, especially Israeli art, a sculpture garden and a youth wing. The museum hosted the semi-final allocation draw for the Eurovision Song Contest 2019 on 28 January 2019. Check out the full Wikipedia article about Tel Aviv Museum of Art.